Not much of today's music is beautifully honest, because honesty is often boring. The simple, and perhaps banal truth is the members of The Snake, The Cross, The Crown are just a few dudes making music. Like anyone else they have jobs, like hanging out with friends, and sometimes get a little lazy with things. 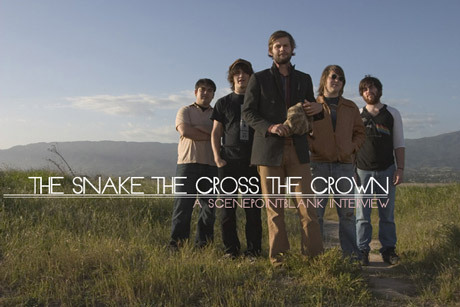 However while most of us take nothing from a seemingly ordinary life, The Snake, The Cross, The Crown has managed to use it as inspiration to create genuine, sincere folk-inspired music. Scottie recently spoke with guitarist and vocalist Kevin Jones about their new album, Cotton Teeth and how things don't always go as planned. Scene Point Blank: First can you explain what the title of the album, Cotton Teeth means? I did some internet research and couldn't pull up any references? Kevin Jones: It's a cheers of sorts that we learned from a gentleman we toured with, a gentleman by the name of William Elliot Whitmoreâ? ?he's a musician. That was his cheers, he would say, "may the jaws of death have cotton teeth" and that was a saying of his that everyone liked and we just kind of took it out of context and used it. Some of the stuff we were doing, he was already doing in some respectsâ? ?kind of ahead of the game in certain notions. A kind of down home feeling. We like him and we liked the cheers and we needed a title so we used it. Scene Point Blank: For those who are familiar with the band can you talk about the lapse between Cotton Teeth and Mander Salis ? It seemed like you were really gaining momentum with Mander Salis and then you just dropped out of the music scene? Kevin Jones: I understand how people could see it like that, but it didn't seem that way to us. Mander Salis was definitely more ambitious, it was our first real album that was distributed and I think we bit off a little more than we can chew, as most bands do when they have a label and their first record coming out. We toured in sort of unorganized fashion and we were a poor touring vehicle, we had a hard time keeping focus and enjoying ourselves constantly as a group. It didn't seem like we gained popularity either; it seemed like the trajectory we were on didn't seem like what we wanted. Towards the end of our touring it didn't seem like more people were coming; it kind of felt like just the opposite. So, in our minds, it didn't feel like we were quitting. We never even thought about calling it quits as a band. We just didn't want to tour for a while. We even suggested other possibilities like internet recordings and things like that, a serialization of music, basically other methods than [release an album] and tour, [release an album] and tour, but the labelâ? ?Equal Vision is a relatively small label and doesn't a lot of fundsâ? ?was kind of skeptical or doing something like that so we just couldn't do anything for about two years so we just went home and tried to learn from our mistakes. We tried to do it again with a more realistic approach to both the album and the touring. A lot of it just had to with growing up, I'd say that is the main difference with the time between the two albums. Scene Point Blank: The album was recorded in April of last year, why such the delay on getting it released? Kevin Jones: Yeahâ??wowâ?? it was recorded in April of last year, but we didn't have a title or track listing or any real plans so the record label just held onto it. We were kind of waiting for someone else to make the first move and the record label was waiting on us to put things together so eventually they gave us a release date and that [sped things up]. We're kind of procrastinatorsâ? ?serious procrastinatorsâ? ?so necessity made us finish it all up and put it all together for release. Scene Point Blank: Speaking of putting it all together, since I got a promo copy I didn't see the artwork until after I was well aquatinted with the music. I had seen the cover art and was real interested in how the layout would look. When I finally saw it, it was just the lyrics and this short story; it took me off guard. Why go with the short story? Kevin Jones: We were just as caught off guard. The guy who does our artwork, he's done all of our artwork, he had spoken about doing a short story for an album a long time ago and we were like, "oh that sounds really neat" and it had been about a year and half since we heard that idea. Then we were asking him to put together the artwork for this release and we had a deadline. When we got it there was this short story in it and we were like, "OOOkayâ?¦um,cool" and it was kind of weird but we read it and were like, "okay." I mean it's interesting, it has something to do with the artwork I suppose. It gives you something read. For practical purposes, you can do something with it. It wasn't that bad of a story; it's kind of young and youthful, to me it seemed like something a little brother you wish you had had written. It seemed alright. He wanted it and we always trusted him with the art so we said okay. Scene Point Blank: Getting back to the recording and songwriting, when writing for this new album and since Mander Salis was released you were all living together in one house in California; Do you all still live together? Kevin Jones: No, no we don't. We all moved away from Santa Barbara in July of last year. The brothers are in Bronxville, New York, right outside of Yonkers at school. The drummer is in Michigan and I'm in Albany. Words by Scottie on Oct. 16, 2010, 11:05 a.m.
Posted by Scottie on Oct. 16, 2010, 11:05 a.m.
Posted Aug. 10, 2007, 8:48 a.m.
Posted June 14, 2007, 7:08 a.m.
Posted April 11, 2007, 10:24 a.m.
Mewithoutyou, Piebald, The Snake The Cross The Crown, and Manchester Orchestra will be hitting the road together this Summer. To view the dates, click "read more."